What if I told you that a major reason for uneven skin tone is the lack of using a product with SPF in it? Many of us grew up not using any type of sun block. I certainly didn’t think I needed it because my skin colour gave me natural protection from the sun, so I figured that I didn’t need to wear sun block or use anything with SPF. Little did I know that sun exposure either causes or exacerbates many skin conditions and appearance issues, especially dark spots, blemishes, discolouration and skin tags. So sun protection should actually be part of every woman’s beauty routine, despite her skin tone. With winter coming, it’s important to remember that even when it’s cloudy outside, you can still get effected by harmful sun rays. I’ve inherited skin tags from both of my parents, and unprotected exposure to the sun makes them worse. I regret not knowing better before, but now I do, so I make sure that my regular skin care products have a level of SPF in them. It’s light. It doesn’t feel greasy or heavy on my face. It keeps my skin moisturised all day in this very, very dry Joburg climate. It has an SPF of 15 so it’s giving my skin a layer of protection against the damaging effects of the sun and helping to keep my skin tone even. It has berries and soy as its main ingredients, keeping the formula gentle. The range is made up of four products; Even Complexion Day Cream with SPF15, Night Cream, Facial Wash and Cleansing Bar. On a day when I don’t need to exfoliate my face and I want a more gentle cleanse, then I’ll use the facial wash – it doesn’t dry out my skin. The entire range gently care for your face on a very affordable level, retailing between R19.95 – R54.95. WIN A Johnson’s Even Complexion Hamper! If you’re still battling with an uneven skin tone and would like to try a range to help you, enter my giveaway. I’ve partnered with Johnson’s to give one lucky A&L reader an Even Complexion hamper! **Competition closed. Congratulations to Mernicia Manders (blog) and @Okamavusot (Instagram). @Okamavusot, please reply your DM ASAP or you’ll forfeit your prize. In the comments below, name your skin complexion concern and how Johnson’s can help with it. The competition will close at 4pm on Wednesday 18th April, 2018. This competition is open to South African residents only. One (1) blog winner and one (1) Instagram winner will be chosen and announced on this and tagged in the original Instagram post by Friday 20th April, 2018. The winner will be contacted via e-mail and Instagram DM so please be available to supply full contact and delivery details. If the winner does not respond to the email/DM within 48 hours of contact, another winner will be chosen and the original winner will forfeit their prize. All prize delivery logistics will be handled by a Johnson’s representative. I’m in Living and Loving! I love any Johnson products. I’ve been using them since birth. Even the colgnes and powders im still using it and the new wash soaps smells amazing ♡♡. My biggest concern with my skin texture and complexion is that of sensitivity, oily spots and dry spots, dark rings around my eyes and damage of eczema, which is gone now thank goodness. I’ve got a light tanned skin complexion. I’ve seen this product and is always doubtful, however after the tutorial and reading up more about it. It seems like this is where im headed. Sticking to my Johnson brand from head to toe. I know Johnson sells at good quality, so it would even be much better if i can take on my facial issues with your product. Please grant me the opportunity. I will market them for you too. Help me Johnson’s to make my Face dream come true. I have a combination skin type and have also developed some pigmentation because of my pregnancy so im hoping there is something in the range which could help with my problem. My uneven skintone and dark spots are really conserning to me. My very big skin problen that I’ve been struggling with since my teens is an acne prone face with is also oily,fark spots&blemishes,did try almost every thing but all they do it they work on my skin for a couple of months then after that the problem comes back. I have a few dark spots and a friend of mine has been using Johnson’s even complexion range for a month now, and I’ve already noticed that her blemishes as a result of a recent breakouts are far lighter than they were before, while some have disappeared entirely. I would love to be given the chance try Johnson’s even complexion range. I used the product. It smells and feels amazing. However it didn’t do much for my dark marks. I’ve used other products which promised to tackle my dark marks and also didn’t work. But… Iam going back to J&J when what I’m using is finished. Uneven skin tone and dark marks runs in my family. It usually rears its ugly head when you’re in your mid 40’s. I’m not quite there yet, and would love to try and get it under control before it starts. I love being out in the sun with my kids alot. We play alot of sports. But my skin tends to burn even with sunblock. I can feel it for a few days. I am I need of all round protection. I have oily skin. I guess one good thing is that I won’t really have wrinkles when I’m older but one bad thing is adult acne!!! Never had issues as a teenager but As soon as I had my son in 2009 , my skin started changing. Pregnancy blemishes just didn’t really ever go away. In summer they darken and it makes me want to put on BB cream to hide it but I know that will make it worse. It’s embarrassing really … I’m now 30 and it’s time to take care of my skin! I honestly don’t know what to do with my skin. It gets really oily some days, other days it’s pealing and super dry. My skin tone is uneven. I need help! And from what I’ve read about this range, Johnsons ticks all the boxes! I suffer from skin that gets very oily during the day but dry just after a wash.
Oily skin with whiteheads only ever popping up in between my eyebrows & around my mouth, leaving ugly dark marks in its path of destruction. Johnson’s will help with these ugly dark marks & it will be softer on my skin then what I’m currently using, that’s actually damaging my skin more. Oily skin with whiteheads only ever popping up in between my eyebrows & around my mouth, leaving ugly dark marks in its path of destruction. I always suffer with uneven skin tone trying to cover them with makeup and face powder, I’m also having acne marks pop up and its bad. I know Johnson’s and Johnson’s even tone will come to my rescue. Hoping to win. Fingers crossed. Even complexion but my skin is very oily and has too many spots. 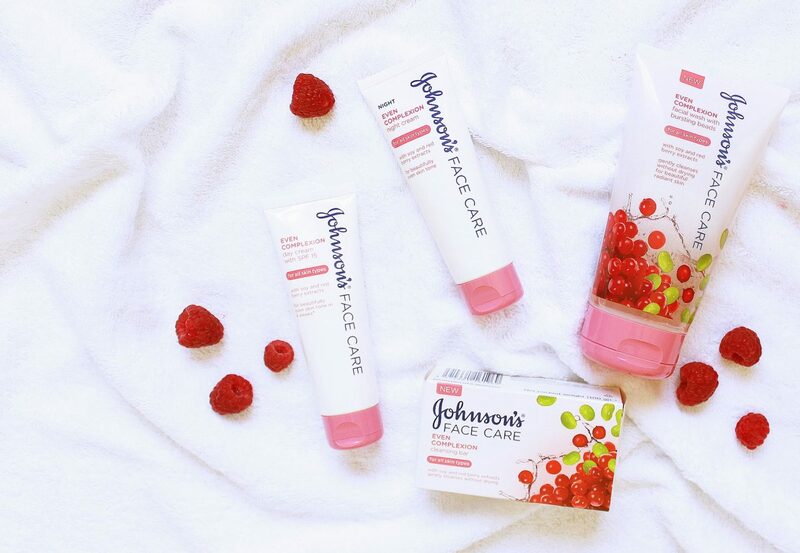 Johnson’s care can help me tone the oil problem and even me a smooth skin tone. I have oily skin, mainly on T-zone area… And then a bit dry elsewhere. My skin tone is also a bit uneven and looks a bit blotchy at times. I’m a young lady, only 25 and it’s quite embarrassing when you use make up and through the make up your oily skin prevails… And then where it’s dry it doesn’t quite last as long. Getting this under control as soon as possible is the best solution I think. I’ve tried a few products but haven’t had the desired result. I’m pretty sure Johnson and Johnson could be the solution to this. I have an oily skin,very oily i have suffered from pimples from late years of my high school (2010), pimples that leave me with dark spots and blemishes, I have tried everything in my power from natural products to store bought products,no change at all.they started on my forehead at first,then they go away I thought i would never develop pimples anymore,then they started developing on my cheeks,they leave me with very dark spots,I sometimes get ashamed to go out because I am not used on putting make up.they lower my confidence..I would love to try on Johnson’s Even Complexion care range, I believe it would help me with my skin problem,I hope it plays a big role in my life,,would really love to try it.. I have very oily and sensitive skin which in return causes really bad breakout. I also have blemishes and uneven skin tone. 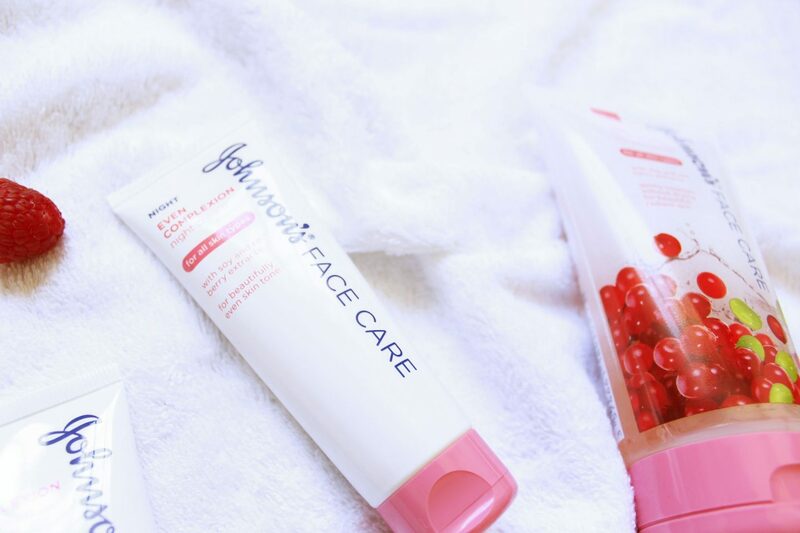 Johnsons can help with clearing the blemishes and reducing the oily skin which will reduce breakout and even my skin tone. I have been in this dreadful condition for many years. I do not go in public and I remain indoors the entire day. I don’t have confidence in anything in my life all due to my skin. I have these age marks on my cheek and this is darkening and spreading. I have lost faith in all products. I am giving my last chance to Johnson’s to save my skin. I am willing to try the even skin tone lotion and hope to see the difference. I recently became a new mommy to a handsome baby boy, the last 2 months of my pregnancy were horrible on my skin. I have blemishes and dark spots on my face and it is messing with my confidence. As an entrepreneur I need confidence to face my clients. My skin goes from normal to very oily, my friend one day even asked me if I put anointing oil my forehead after church, that’s how oily it gets. On top of that the contact with the Sun make my skin get so many pimples. And of cause dark marks are like that one uninvited visitor that doesn’t want to leave. I have dry, uneven skin and the occasional breakout of spots. So I’m praying I’m lucky enough to win this amazing giveaway and finally get my even glow. I have got oily skin who gets very oily in summer. I live in east London which gets very humid and then I sweat a lot which also makes my skin brake out with pimples. I have fair skin with lots of Sun damage and dark spots. It would be nice to find a product that works and that is not to expensive. Wow, First of all what a great Giveaway. I struggle with very dry skin (especially in my face) and honestly I never use anything with Spf in it because until I read your blog post I didnt know that it was necessary .I have a few pigmentation spots in my face and I also struggle with unwanted pimpels especially now because of my pregnancy. Since im pregnant my skin is not so dry anymore, but starting to get oily and that is something that I cant handle because you cant actually Hide it like you can with dry skin. With all the hormones my skin changed so much and I dont even knoe what products to use anymore. We also recently moved to the coast and with the change of climate my skin still needs to adapt. Also going to the beach alot this hamper would help me so much because of the Spf in the products. I would really love to give this product a try and to see the amazing results formyself. My skin really needs this and it would be wonderfull to feel good about myself again. And it would feel like a pamper session. Something us new moms dont get very often. Fingers crossed to be a lucky winner. 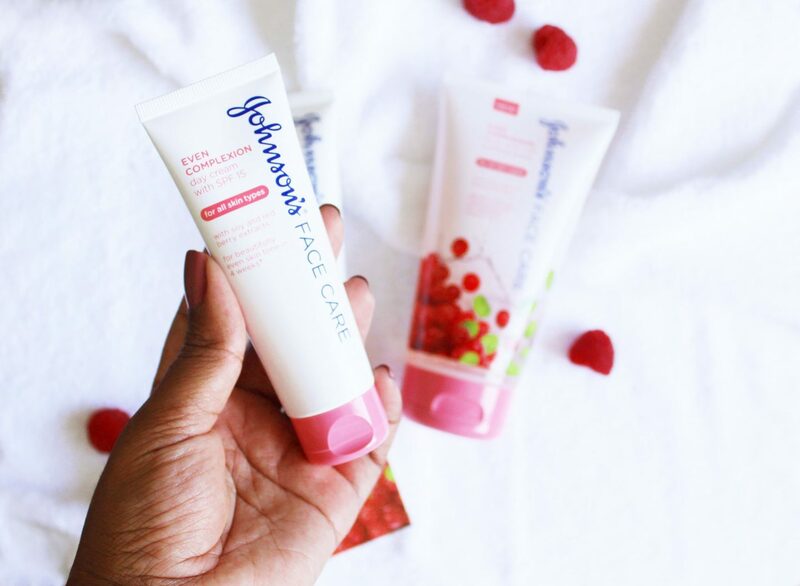 Johnson’s face care even complexion day cream contains SPF15, skin loving soy and red berry extracts and this will help enhance my skin radiance, smoothness and brightness as my skin looks very dull at the moment. I suffer with dry skin and dark marks. I honestly suffer with uneven tone and have to use foundation to cover my skin to give it a even tone look. It will be great to try these products for my skin. As it will be nice to have natural looking skin instead of using foundation all the time. Thank you after all natural is beautiful. I have combination skin,either very dry or oily.Ageing causing dark marks i need help with to even it out. Combination I need a moisturiser that’s light, smooth and non greasy yo keep me fresh faced and hydrated . I suddenly developed oily Skin and acne that leaves black spot on my face…i Never had them before now I do not know what product to use to remove them which won’t be harmful to my skin..I’m light in complexion…i believe Johnson Can Help Me. My skin is Oily and I break out in pimples especially on my cheeks. It really is distressing and I feel so conscious of it. I desperately need help and Johnson’s is what I exactly need to help me, make my skin look and feel great and make me feel proud of my self. Being a student I can’t afford professional help or products so I will appreciate this prize greatly. After having many years of flawless skin ,recently I have developed a severe breakouts that leave a dark black discoloration of my skin . I am desperately in a need to have my skin restored to its natural state . And being a firm believer of Johnson’s products ,I truly believe that the Johnson’s Even Complexion products will restore my skin and add a radiant glow . Uneven skin tone and dark spots – Johnson & Johnsons Even Complexion should help me clear and maintain. I am 41 years old, have polycystic ovaries and suffer with acne and dark marks. I believe Johnsons will be able to assist with lightening my marks and giving the confidence to go without make up. I have pigmentation on my cheeks, chin and forehead and it really depresses me, I wear foundation everyday to cover it up and spend a fortune each month on foundation, concealer and powder only to have the pigmentation peek through at mid day then I have to reapply, I’ve tried almost everything, I even went as far as applying castor oil on my skin every night only to end up with clogged pores, I would really love to give these products a shot, thank you. Hi I have oily skin and due to sun exposure as I walk to and from school..leaving the children..I have many dark spots and blemishes..its unsightly and I would love to try this amazing Johnsons Range to help my skin look brighter and clear all my blemishes away..when a pimple appears it also leaves marks.. And it saddens me as I’ve tried many products but to no avail..really hope I can win this giveaway and help my skin look and feel great..
I’ve been struggling from oily skin for as long as I can remember. I have tried alot of things from natural products to store bought it has just never worked. From popping my pimples I’ve in return caused my skin alot of damage. I have blemishes and very bad uneven skin tone. I’ve been using essential oils and they are not really getting me to where I want my skin to be. I believe Johnson and Johnson will help me with my skin problems and it would be great to try it out and see what it had to offer.